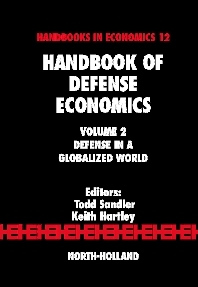 The second volume of the Handbook of Defense Economics addresses defense needs, practices, threats, and policies in the modern era of globalization. This new era concerns the enhanced cross-border flows of all kinds (e.g., capital and labor flows, revolutionary rhetoric, guerrillas, and terrorists) including the spillovers of benefits and costs associated with public goods and transnational externalities (i.e., uncompensated interdependencies affecting two or more nations). These ever-increasing flows mean that military armaments and armies are less able to keep out security threats. Thus, novel defense and security barriers are needed to protect borders that are porous to terrorists, pollutants, political upheavals, and conflicts. Even increased trade and financial flows imply novel security challenges and defenses. Globalization also underscores the importance of a new set of institutions (e.g., the European Union and global governance networks) and agents (e.g., nongovernmental organizations and partnerships). This volume addresses the security challenges in this age of globalization, where conflicts involve novel tactics, new technologies, asymmetric warfare, different venues, and frightening weapons. Volume 2 contains topics not covered in volume 1 – i.e., civil wars, peacekeeping, economic sanctions, the econometrics of arms races, conversion, peace economics, and the interface of trade, peace, and democracy. Volume 2 also revisits topics from volume 1, where there has been a significant advancement of knowledge – i.e., conflict analysis, terrorism, arms races, arms trade, military manpower, and arms industries. All of the main securities concerns of today are analyzed. Chapters are written by the leading contributors in the topic areas. Up-to-date surveys on the pressing defense issues: theoretical, empirical and policy issues. Coverage of theoretical and empirical studies of terrorism. *Contributions by the leading researchers in the field of defense economics.